Larger Project 5-2, Exterior Seating » Roger Perron Inc. 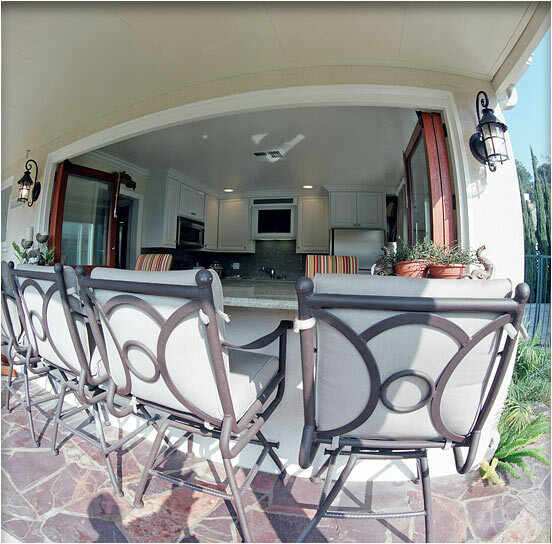 This photo shows exterior seating that connects to an indoor/outdoor bar and see-through kitchen from a newly built guesthouse. The granite counter is green and double thickness to withstand the weather elements. The counter cantilevers out so that seating can go under as shown. The teak wood-frame window was custom made with special hardware, providing a wide-open view to the guests and party. See photo #4 for another view of this addition and remodel.